House with 3 bedrooms with bathroom, for max. 8, pool and large garden. Manor 1949. On the first floor is the apartment, totally independent. lovely decoration. Well stocked with linens and towels. It has 3 double bedrooms, each with its own bathroom, and 2 terraces. There are 2 extra beds and 1 baby cot. Normal capacity is 6 and maximum is 8 people. The kitchen, integrated in the living room, has all the necessary utensils and is equipped with a dishwasher and microwave. It has a room for washing and ironing clothes for guests' use. The garden has a large area to relax with tables, chairs, umbrellas and pool. The home environment is very suitable for hiking and mountain tours. You can enjoy beautiful nearby beaches, which are only a 15 minute drive. In the village of Barx, which is 2 km, there are bars, restaurants and supermarkets and 300 m from the house is a restaurant with a reputation for its paellas. The toilet and bath towels are provided. We had a fantastic stay here. The kids loved the pool. The house was perfect and had everything we needed. Mercedes and Vincent were most hospitable. The view from the balcony was amazing. I would recommend this accommodation to anyone. You will need a car. Overall, perfect. A real gem in the mountains! We stayed in this beautiful villa in July 2018. Our stay was everything we hoped for. It is a beautiful house with an even more gorgeous garden full of trees and flowers,, lovely clean pool and sunny terraces. We were a group of eight including two children and we really felt that the space we had was big enough to accommodate all. The owners are lovely people, very accommodating and helpfull and eventhough they do live in the bottom part of the house we felt like we were the only ones there. This was one of the best holidays we had. The area is so lovely, the views over the mountains from all of the rooms are amazing. There are many walking paths close by and the coast is just a short drive away. We would sincerely recommend this little gem to everyone and we will certainly be coming back. Sanja, thank you very much for your good comments. I have to say that you have been excellent guests, kind and calm. If you came back you would be very welcome. Sanja, muchísimas gracias por sus buenos comentarios. He de decir que ustedes han sido excelentes huéspedes, amables y tranquilos. Si volvieran serían muy bien recibidos. Me and my famliy can give our warmest and most sincere recommendations for a very nice stay in La Drova, Spain. We felt a great welcome from our hosts who did their best to make our stay pleasant and joyful. The house and its surroundings are altogether a perfect fit for spending your holiday. We enjoyed the hospitality and tranquility from the local people along with great food and drinks in the local resteaurants and bars in Barx. La casa está muy bien, la piscina también y el entorno está genial entre montañas y muy fresquito para verano. Lo malo que tiene es que si alquilas la casa completa lo que alquilas es la primera planta y en la planta baja vive el propietario y eso no lo dejan claro en la descripción y te llevas la sorpresa cuando llegas allí. Deberían ser mas claros en la descripción y cuando hablas con ellos al menos comentarlo por si no es lo que buscas. nous avons séjourné 2 semaines avec des amis, c'est une maison très agréable au calme, propre, la piscine est entretenue. Les propriétaires sont très accueillant, discret, et a l’écoute. les photos sont conformes a la maison. Der kleine Ort La Drova liegt inmitten wunderbarer Natur und bezaubernder Berglandschaft. Im Ort gibt es ein sehr zu empfehlendes Paella-Restaurant. Im Nachbarort Barx (2km) gibt es alles was man benötigt (Von Apotheke über Bäcker und Metzger und Restaurants bis hin zu Supermärkten). In ca 10-15 Autominuten entfernten Stadt Gandia gibt es auch große Supermärkte, sowie eine Strandpromende und einem sehr weitläufigen, sauberen , nicht überfüllten, schönen Strand. Das Haus selbst verfügt über 3 Schlafzimmer mit jeweils eigenem Bad und Balkon, einem Wohnzimmer mit angeschlossener Küche. W-Lan ist verfügbar. Sehr schön ist der Pool zur alleinigen Mieterbenutzung und der dazugehörige Garten und Terrasse. Wir sind zu 7. angereist und besonders die 5 Kinder liebten den Pool. Es ist alles sehr gepflegt. Bei längeren Aufenthalt wird nach einer halben Woche alles gereinigt und Bettwäsche und Handtücher ausgetauscht. Falls nötig steht auch eine Waschmaschine zur Verfügung. Die Vermieter wohnen unten auch im Haus (haben eigenen Garten) und sind sehr herzlich und freundlich. Sie sind in keiner Weiße aufdringlich oder treten irgendwie in den Vordergrund, kurz gesagt man bemerkt sie nicht. Es sei denn man hat ein Anliegen (von Wanderempfehlungen, über Restaurantempfehlungen oder -reservierungen, "Geheimtipps" Informationen jeglicher, sie sind dazu stets ansprechbar und haben eine Lösung). Wir haben uns in der Casona de Ferrando immer sehr wohl gefühlt. Es war sicher nicht unser letzter Urlaub dort! Ein Ausflug in die Metropole Valencia (wir fuhren mit dem Auto, dort wäre der nächste Flughafen) lohnt sich! The Cottage 'La Casona de Ferrando' is located in the beautiful valley of La Drova, km. 9. 9 CV-675 that connects Gandia with Barx and Simat of Valldigna road. 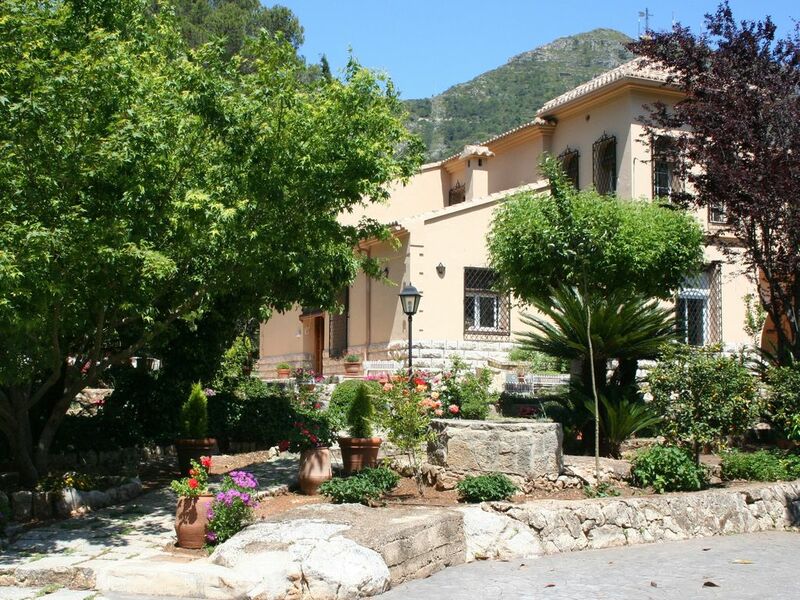 It is only 15 km from the beach of Gandia and toggles the bush walks with bathing in the sea. The altitude of 400 m above sea level provides a pleasant and cool nights during the summer. It is especially appreciated by people seeking proximity to beaches and want a quiet area to rest. The nearby cities are: Gandia, 10 km . ; Xativa to 20 km . ; Valencia 70 km . ; Benidorm 90 km .. They are very interesting for cultural tourism in the city centers, theme parks (Bio-Park, Oceanografic; Hemisferic, Aqualandia, Terra Mitica ...) and shopping areas or leisure. In the small town of Barx, 2 km. house, grocery shopping can be done and find several inexpensive restaurants. Para estancias cortas solicite la oferta del propietario. Para Navidad y Fin de Año estancia para la casa completa y mínimo 2 días a 210 € por día. Precios de alquiler por habitación: Temporada Baja:50 €/día; 322 €/semana. Temporada Alta: 65 €/día; 364 €/semana. Precio de una cama supletoria: 15 €/noche. Los precios de casa completa, incluyen la asistencia de limpieza 2 veces por semana.